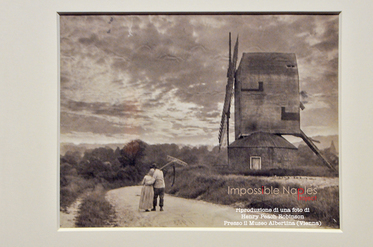 The painter who invented the photomontage. Henry Peach Robinson (1830-1901); pictorialist, the most influential English photographer of the second half of the 19th century. He was the pioneer of the photomontage. At the age of 21, Robinson was quite a precocious painter. Although he received recognition at the Royal Academy of Arts by having his work exhibited in London, he discovered shortly thereafter that his real passion was photography. In 1857, Robinson opened a photographic studio where he took portraits on commission and, at the same time, developed a new technique called combination printing. This composition technique required taking multiple photos of different subjects and then superimposing the photographic plates in order to print one hybrid photograph. The resultant image completely captured the rural, pictorial atmosphere of the period. Robinson's most famous image, “Fading Away” (1858), comes from the superimposition of five plates in the printing phase. In Tunbridge Wells (see photo), the sky is on its own individual plate, which would then be combined with a separate plate for the rest of the landscape. I personally do not know Henry Peach Robinson, and I wish I could've had the opportunity to do so. I did, however, run into some of his images at the Albertina Museum in Vienna . He truly is the pioneer of photomontages. Photoshop now has the function to automate the painstaking process that Robinson done back in the day. Today, digital photomontage editing makers owe Robinson much thanks.